The U.S. Marine Corps (USMC) is the nation’s expeditionary armed force, positioned and ready to respond to crises around the world. Marine units assigned aboard ships (“soldiers of the sea”) or at bases abroad stand ready to project U.S. power into crisis areas. Marines also serve in a range of unique missions, from combat defense of U.S. embassies under attack abroad to operating the President’s helicopter fleet. Although Marines have a wide variety of individual assignments, the focus of every Marine is on combat: Every Marine is first a rifleman. The USMC has positioned itself for crisis response and has evolved its concepts to leverage its equipment more effectively to support operations in a heavily contested maritime environment such as the one found in the Western Pacific. The measures of Marine Corps capacity in this Index are similar to those used to assess the Army’s: end strength and units (battalions for the Marines and brigades for the Army). The Marine Corps’ basic combat unit is the infantry battalion, which is composed of approximately 900 Marines and includes three rifle companies, a weapons company, and a headquarters and service company. In 2011, the Marine Corps maintained 27 infantry battalions in its active component at an authorized end strength of 202,100.7 As budgets declined, the Corps prioritized readiness through managed reductions in capacity, including a drawdown of forces, and delays or reductions in planned procurement levels. After the Marine Corps fell to a low of 23 active component infantry battalions in FY 2015,8 Congress began to fund gradual increases in end strength, returning the Marine Corps to 24 infantry battalions. President Donald Trump’s FY 2019 budget request would increase the size of the active component Marine Corps by only 1,500 over the congressionally authorized level of 185,000 in FY 2018.9 Despite increases in active component end strength, the President’s FY 2019 budget provides enough support for only 24 infantry battalions. Additional manpower will backfill existing units and help the Marine Corps to recruit and retain individuals with critical skillsets and specialties. One impact of reduced capacity is a strain on Marines’ dwell time. Cuts in capacity—the number of units and individual Marines—enabled the Marine Corps to disperse the resources it did receive among fewer units, thus maintaining higher readiness levels throughout a smaller force. However, without a corresponding decrease in operational requirements, demand for Marine Corps units and assets has resulted in unsustainable deployment rates.10 For example, as a result of sustained engagement in the Middle East, diminished capacity, and increased operational tempo (OPTEMPO), Marine Corps tactical aviation units have been operating under a surge condition (in excess of a 1:2 deployment-to-dwell ratio) “for more than fifteen years.”11 This increased deployment frequency has exacerbated the degradation of readiness as people and equipment are used more frequently with less time to recover between deployments. The stated ideal deployment-to-dwell (D2D) time ratio is 1:3 (seven months deployed for every 21 months at home).12 This leaves more time available for training and recovery and provides support for a “ready bench,” without which readiness investments are immediately consumed. Current budget constraints support only “an approximate 1:2 D2D ratio in the aggregate.”13 A return to BCA-level budget caps could reduce capacity even further, and the dwell ratio for the Marine Corps could fall to 1:1.14 The same problems are present across the Marine Corps’ aviation units and amphibious assets. Infantry battalions serve as a surrogate measure for the Corps’ total force. As the first to respond to many contingencies, the Marine Corps requires a large degree of flexibility and self-sufficiency, and this drives its approach to organization and deployment of operational formations that, although typically centered on infantry units, are composed of ground, air, and logistics elements. Each of these assets and capabilities is critical to effective deployment of force, and any one of them can be a limiting factor in the conduct of training and operations. Shallow acquisition ramps for the F-35 pose similar problems for the service’s fighter fleet. As the F-35 enters into service and legacy platforms reach the end of their service lives, the Marine Corps expects a near-term inventory challenge due to a combination of reduced Joint Strike Fighter (JSF) procurement, increasing tactical aircraft utilization rates, and shortfalls in F/A-18A-D and AV-8B depot facility production.28 Any reduction in Marine aviation capability has a direct effect on overall combat capability, as the Corps usually fights with its ground and aviation forces integrated as Marine Air-Ground Task Forces (MAGTFs). The USMC continues to invest in the recapitalization of legacy platforms in order to extend platform service life and keep aircraft and amphibious vehicles in the fleet, but as these platforms age, they also become less relevant to the evolving modern operating environment. Thus, while they do help to maintain capacity, programs to extend service life do not provide the capability enhancements that modernization programs provide. The result is an older, less-capable fleet of equipment that costs more to maintain. The nature of the Marine Corps’ crisis response role requires capabilities that span all domains. The USMC ship requirement is managed by the Navy and is covered in the Navy’s section of the Index. 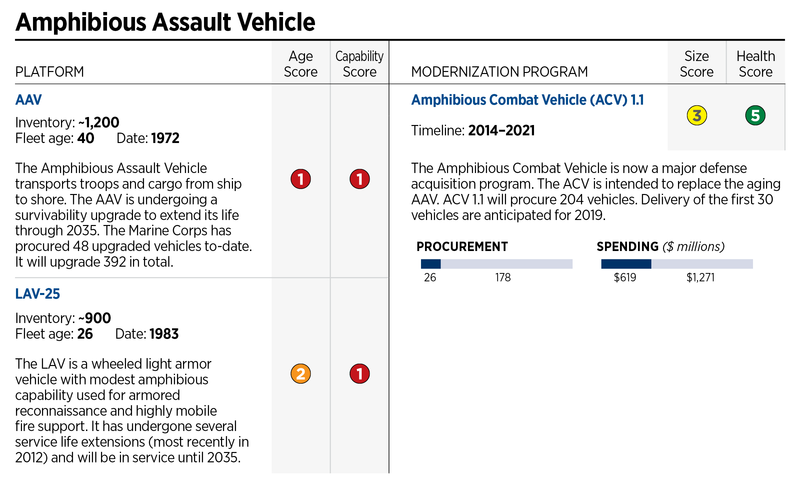 The Marine Corps is focusing on “essential modernization” and emphasizing programs that “underpin our core competencies,” making the Amphibious Combat Vehicle (ACV) and F-35 JSF programs its top two priorities.32 However, modernization spending still accounts for only 14 percent of the Marine Corps’ proposed FY 2019 budget,33 compared to 21 percent for the Army, 47 percent for the Air Force, and 45 percent for the Navy.34 The Corps’ aircraft, tanks, and ground combat vehicles are some of the oldest in the entire U.S. inventory. The President’s budget request for FY 2018 would fund the final year of low-rate initial production for the JLTV, including 1,642 vehicles for the Marine Corps and limited procurement quantities for the Air Force.63 Because the JLTV will not be a one-for-one replacement of the HMMWV, there are concerns that limited procurement will create a battlefield mobility gap for some units.64 Although the Marine Corps reached a decision to increase its acquisition objective from 7,241 to 9,091,65 this will still only partially offset the inventory of 17,000 HMMWVs.66 The service is considering what percent of the fleet should be replaced by the JLTV and what percent of the requirement might be filled by lighter wheeled vehicles.67 As end strength and combat units return to each of the services, this could further affect JLTV requirements and result in additional procurement demand. The Marine Corps intends to replace the AAV-7A1 with the ACV, planned “to enter the acquisition cycle at Milestone B (Engineering and Manufacturing Development) in FY2016, award prototype contracts leading to a down select to one vendor in FY2018, and [then] enter low-rate initial production.”73 The ACV, which took the place of the Expeditionary Fighting Vehicle (EFV), “has been structured to provide a phased, incremental capability.”74 The AAV-7A1 was to be replaced by the EFV, a follow-on to the cancelled Advanced AAV, but the EFV was also cancelled in 2011 as a result of technical obstacles and cost overruns. Similarly, the Corps planned to replace the LAV inventory with the Marine Personnel Carrier (MPC), which would serve as a Light Armored Vehicle with modest amphibious capabilities but would be designed primarily to provide enhanced survivability and mobility once ashore.75 However, budgetary constraints led the Corps to shelve the program, leaving open the possibility that it might be resumed in the future. Today, the USMC MV-22 Osprey program is operating with few problems and nearing completion of the full acquisition objective of 360 aircraft.85 The Marine Corps added one squadron to its active component over the past year, bringing the total to 15 fully operational squadrons in the active component.86 Two additional squadrons are expected to stand up in FY 2018, followed by the final active component squadron in FY 2019.87 The MV-22’s capabilities are in high demand from the Combatant Commanders (COCOMS), and the Corps is adding capabilities such as fuel delivery and use of precision-guided munitions to the MV-22 to enhance its value to the COCOMs. The Marine Corps’ first priority is to be the crisis response force for the military, which is why investment in immediate readiness has been prioritized over capacity and capability. Although this is sustainable for a short time, future concerns when the Budget Control Act was passed are rapidly becoming impediments in the present. 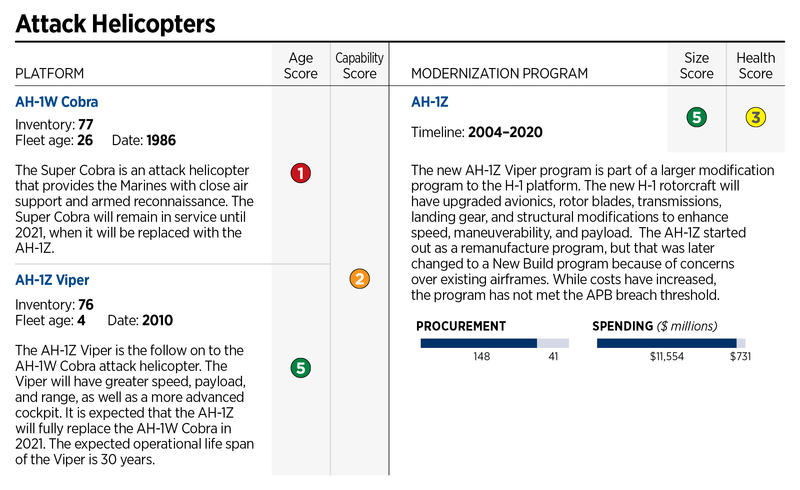 Modernization is now a primary inhibitor of readiness as keeping aging platforms in working order becomes increasing challenging and aircraft are retired before they can be replaced, leaving a smaller force available to meet operational requirements and further increasing the use of remaining platforms. In December 2017, a U.S. Government Accountability Office (GAO) official testified that while deploying units completed all necessary pre-deployment training for amphibious operations, the Marine Corps was “unable to fully accomplish…home-station unit training to support contingency requirements, service-level exercises, and experimentation and concept development for amphibious operations.”103 A shortage of available amphibious ships was identified as the primary factor in training limitations. Of the 32 amphibious ships currently in the U.S. fleet, only 16 are considered “available to support current or contingency operations.”104 While infantry battalions can maintain unit-level readiness requirements, their utility depends equally on their ability to deploy in defense of U.S. interests. However, readiness gains have begun to plateau.109 The Marine Corps received funding for spare parts at the “maximum executable levels” in FY 2017 and even higher levels in FY 2018.110 In FY 2017, the Corps added only six ready basic aircraft to the fleet, compared to 44 in FY 2016,111 yielding only modest increases in flight hours of two per crew per month in 2017. Although the Marine Corps is working to maximize their utilization, as long as it continues to rely on legacy systems, the amount of time committed to maintenance and access to spare parts will constrain aircraft availability. Readiness rates remain particularly stressed within certain high-demand communities (including the MV-22, F/A-18, and F-35) that lack necessary numbers of available aircraft, pilots, and maintainers.112 Although the MV-22 is a relatively new platform and is operating with few problems, high demand has held its readiness rates at 48 percent and forced the Marine Corps to put these aircraft “into operation as fast as they were coming off the line.”113 As is the case with the Corps’ infantry battalions, this leaves little capacity available to support a “ready bench,” and immediate demand challenges efforts to reduce the platform to a common configuration. Availability of spare parts remains “the primary degrader of Marine aviation readiness.”114 Although adequate funding for spare parts and maintenance will help to maintain current numbers of ready basic aircraft, the Marine Corps recognizes that “modernization of [its] legacy fleet is the true key to regaining readiness.”115 The transition to modern systems will increase capacity, dispersing some of the strain from high utilization rates and offsetting costs from legacy platforms, which require more time and money to maintain. The Marines Corps’ Ground Equipment Reset Strategy, developed to recover from the strain of years of sustained operations in Iraq and Afghanistan, is nearing completion after being delayed from the end of FY 2017 to FY 2019. As of March 2018, the Marine Corps had reset approximately 99 percent of its ground equipment, compared to 90 percent in the prior year.120 Reconstituting equipment and ensuring that the Corps’ inventory can meet operational requirements are critical aspects of readiness. Based on the deployment of Marines across major engagements since the Korean War, the Corps requires roughly 15 battalions for one MRC.121 This translates to a force of approximately 30 battalions to fight two MRCs simultaneously. The government force-sizing documents that discuss Marine Corps composition support this. Though the documents that make such a recommendation count the Marines by divisions, not battalions, they are consistent in arguing for three Active Marine Corps divisions, which in turn requires roughly 30 battalions. With a 20 percent strategic reserve, the ideal USMC capacity for a two-MRC force-sizing construct is 36 battalions. More than 33,000 Marines were deployed in Korea, and more than 44,000 were deployed in Vietnam. In the Persian Gulf, one of the largest Marine Corps missions in U.S. history, some 90,000 Marines were deployed, and approximately 66,000 were deployed for Operation Iraqi Freedom. As the Persian Gulf War is the most pertinent example for this construct, an operating force of 180,000 Marines is a reasonable benchmark for a two-MRC force, not counting Marines that would be unavailable for deployment (assigned to institutional portions of the Corps) or that are deployed elsewhere. This is supported by government documents that have advocated a force as low as 174,000 (1993 Bottom-Up Review) and as high as 202,000 (2010 Quadrennial Defense Review), with an average end strength of 185,000 being recommended. However, as recent increases in end strength have not corresponded with deployable combat power, these government recommendations may have to be reassessed. Actual 2018 Level: 24 battalions. Despite an increase in manpower, the Corps continues to operate with less than 67 percent of the number of battalions relative to the two-MRC benchmark. Marine Corps capacity is therefore scored as “weak” again in 2018. 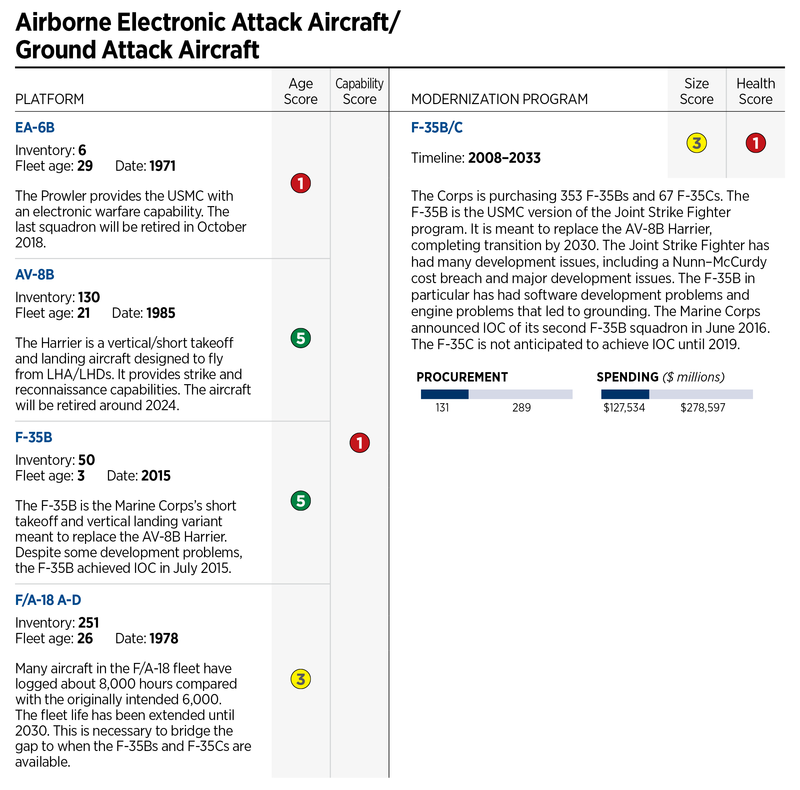 The Corps receives scores of “weak” for “Capability of Equipment,” “marginal” for “Age of Equipment” and “Health of Modernization Programs,” but “strong” for “Size of Modernization Program.” Therefore, the aggregate score for Marine Corps capability is “marginal.” Excluded from the scoring are various ground vehicle programs that have been cancelled and are now being reprogrammed. In FY 2018, the Marine Corps again prioritized next-to-deploy units. As the nation’s crisis response force, the Corps requires that all units, whether deployed or non-deployed, be ready. However, since most Marine Corps ground units are meeting readiness requirements only immediately before deployment and the Corps’ “ready bench” would “not be as capable as necessary” if deployed on short notice, USMC readiness is sufficient to meet ongoing commitments only at reported deployment-to-dwell ratios of 1:2. This means that only a third of the force—the deployed force—could be considered fully ready. Furthermore, as of November 2017, the USMC reported that only half of its tactical aircraft were considered flyable. Although 2018 congressional testimony strikes an optimistic note and increased funding for readiness and an emphasis on modernization give strong support to the Corps’ readiness-recovery efforts, the effects will take time to materialize. As a result, the Marine Corps maintains an overall score of “weak” in the 2019 Index. 1. U.S. Department of the Navy, <i>Department of the Navy FY 2019 President’s Budget</i>, February 12, 2018, p. 4,<a data-cke-saved-href=" http:="" www.secnav.navy.mil=""> http://www.secnav.navy.mil/fmc/fmb/Documents/19pres/DON_Press_Brief.pdf (accessed August 9, 2018). 2. Lieutenant General Ronald L. Bailey, Deputy Commandant for Plans, Policies, and Operations; Lieutenant General Jon M. Davis, Deputy Commandant for Aviation; and Lieutenant General Michael G. Dana, Deputy Commandant for Installations and Logistics, statement on “The Current State of the Marine Corps” before the Subcommittee on Readiness, Committee on Armed Services, U.S. House of Representatives, April 5, 2017, p. 5, http://docs.house.gov/meetings/AS/AS03/20170405/105768/HHRG-115-AS03-Wstate-BaileyUSMCR-20170405.pdf (accessed August 9, 2018). 3. Lieutenant General Steven R. Rudder, Deputy Commandant for Aviation, United States Marine Corps, statement on “Aviation Readiness” before the Subcommittee on Readiness, Committee on Armed Services, U.S. House of Representatives, November 9, 2017, p. 1, https://docs.house.gov/meetings/AS/AS03/20171109/106611/HHRG-115-AS03-Bio-RudderS-20171109.pdf (accessed August 9, 2018). http://www.hqmc.marines.mil/Portals/142/Docs/CMC%20Testimony%202015/USMC%20FY16%20Written%20Posture%20Statement_FINAL.pdf (accessed August 9, 2018). https://comptroller.defense.gov/Portals/45/Documents/defbudget/fy2019/FY2019_Budget_Request_Overview_Book.pdf (accessed August 9, 2018). 6. General Glenn Walters, Assistant Commandant of the Marine Corps, statement on “Marine Corps Readiness” before the Subcommittee on Readiness, Committee on Armed Services, U.S. Senate, February 14, 2018, p. 2, https://www.armed-services.senate.gov/imo/media/doc/Walters_02-14-18.pdf (accessed August 12, 2018). 7. U.S. Department of the Navy, Department of the Navy Fiscal Year (FY) 2011 Budget Estimates, Justification of Estimates: Military Personnel, Marine Corps, February 2010, p. 4, http://www.secnav.navy.mil/fmc/fmb/Documents/11pres/MPMC_Book.pdf (accessed August 20, 2018). http://comptroller.defense.gov/Portals/45/Documents/defbudget/fy2016/FY2016_Budget_Request_Overview_Book.pdf (accessed August 20, 2018). 9. U.S. Department of the Navy, Office of Budget, Highlights of the Department of the Navy FY 2019 Budget, 2018, p. 1-4, 2-7, and 2-8, http://www.secnav.navy.mil/fmc/fmb/Documents/19pres/Highlights_book.pdf (accessed August 16, 2018), and U.S. Department of Defense, Office of the Under Secretary of Defense (Comptroller)/Chief Financial Officer, United States Department of Defense Fiscal Year 2018 Budget Request: Defense Budget Overview, May 2017, pp. 2-6, 2-8, and 7-14, http://comptroller.defense.gov/Portals/45/Documents/defbudget/fy2018/fy2018_Budget_Request_Overview_Book.pdf (accessed August 16, 2018). 10. General Robert B. Neller, Commandant of the Marine Corps, statement on “The Posture of the United States Marine Corps” before the Committee on Appropriations, U.S. House of Representatives, March 7, 2018, p. 15, https://docs.house.gov/meetings/AP/AP02/20180307/106932/HHRG-115-AP02-Wstate-NellerR-20180307.pdf (accessed August 16, 2018). 11. Rudder, statement on “Aviation Readiness,” November 9, 2017, p. 2. 12. General John Paxton, Assistant Commandant of the Marine Corps, statement on “U.S. Marine Corps Readiness” before the Subcommittee on Readiness, Committee on Armed Services, U.S. Senate, March 15, 2016, p. 8, https://www.armed-services.senate.gov/imo/media/doc/Paxton_03-15-16.pdf (accessed August 14, 2018). 13. Neller, statement on “The Posture of the United States Marine Corps,” March 7, 2018, p. 16. 14. Testimony of General Joseph F. Dunford, Jr., Commandant of the Marine Corps, in stenographic transcript of Hearing to Receive Testimony on the Impact of the Budget Control Act of 2011 and Sequestration on National Security, Committee on Armed Services, U.S. Senate, January 28, 2015, p. 74, http://www.armed-services.senate.gov/imo/media/doc/15-04%20-%201-28-15.pdf (accessed August 16, 2018). 15. U.S. Marine Corps, 2018 Marine Aviation Plan, p. 23, https://www.aviation.marines.mil/Portals/11/2018%20AvPlan%20FINAL.pdf (accessed August 16, 2018). 16. U.S. Marine Corps, 2017 Marine Aviation Plan, p. 54, www.aviation.marines.mil/Portals/11/2017%20MARINE%20AVIATIOIN%20PLAN.pdf (accessed August 13, 2017). 17. Congressional Quarterly, “House Armed Services Committee Holds Hearing on Aviation Readiness,” CQ Congressional Transcripts, July 6, 2016, http://www.cq.com/doc/congressionaltranscripts-4922435?3&search=lXd1KGHk (accessed August 17, 2017). 18. Paxton, statement on “U.S. Marine Corps Readiness,” March 15, 2016, p. 9. 19. Rudder, statement on “Aviation Readiness,” November 9, 2017, p. 4. 22. U.S. Marine Corps, 2018 Marine Aviation Plan, p. 10. 23. Rudder, statement on “Aviation Readiness,” November 9, 2017, p. 7. 24. U.S. Marine Corps, 2018 Marine Aviation Plan, p. 78. 25. U.S. Marine Corps, 2017 Marine Aviation Plan, pp. 70 and 76.
http://navalaviationnews.navylive.dodlive.mil/files/2017/08/NAN-Summer2017_web.pdf (accessed August 20, 2018). 27. Kris Osborn, “Marines: ‘We Plan To Have the MV-22B Osprey for at Least the Next 40 Years,’” National Interest, May 2, 2018, https://nationalinterest.org/blog/the-buzz/marines-%E2%80%9Cwe-plan-have-the-mv-22b-osprey-least-the-next-40-25654 (accessed August 16, 2018). 28. Vice Admiral Paul Grosklags, Principal Military Deputy, Assistant Secretary of the Navy (Research, Development and Acquisition); Rear Admiral Michael C. Manazir, Director, Air Warfare; and Lieutenant General Jon Davis, Deputy Commandant for Aviation, statement on “Department of the Navy’s Aviation Programs” before the Subcommittee on Seapower, Committee on Armed Services, U.S. Senate, March 25, 2015, p. 10, http://www.armed-services.senate.gov/imo/media/doc/Grosklags_Manazir_Davis_03-25-15.pdf (accessed August 13, 2017). 29. Lieutenant General Brian D. Beaudreault, Deputy Commandant, Plans, Policies, and Operations, statement on “Amphibious Warfare Readiness and Training—Interoperability, Shortfalls, and the Way Ahead” before the Subcommittee on Readiness, Committee on Armed Services, U.S. House of Representatives, December 1, 2017, p. 3, https://docs.house.gov/meetings/AS/AS03/20171201/106681/HHRG-115-AS03-Wstate-BeaudreaultB-20171201.pdf (accessed August 16, 2018). 31. General Glenn Walters, Assistant Commandant of the Marine Corps, statement on “Marine Corps Readiness” before the Subcommittee on Readiness, Committee on Armed Services, U.S. Senate, February 8, 2017, p. 5, https://www.armed-services.senate.gov/imo/media/doc/Walters_02-08-17.pdf (accessed August 19, 2018). 32. General John Paxton, Assistant Commandant, United States Marine Corps, statement on Marine Corps readiness and FY 2016 budget request before the Subcommittee on Readiness and Management Support, Committee on Armed Services, U.S. Senate, March 25, 2015, pp. 10–11, http://www.armed-services.senate.gov/imo/media/doc/Paxton_03-25-15.pdf (accessed August 14, 2018). 33. U.S. Department of the Navy, Department of the Navy FY 2019 President’s Budget, p. 8. 34. U.S. Department of Defense, Office of the Under Secretary of Defense (Comptroller)/Chief Financial Officer, United States Department of Defense Fiscal Year 2019 Budget Request: Defense Budget Overview, pp. 8-1 and 8-12. 35. Lieutenant General Michael Dana, Deputy Commandant, Installations and Logistics, statement on “Marine Corps Readiness” before the Subcommittee on Readiness, Committee on Armed Services, U.S. House of Representatives, March 6, 2018, p. 3, https://docs.house.gov/meetings/AS/AS03/20180306/106942/HHRG-115-AS03-Wstate-DanaM-20180306.pdf (accessed August 14, 2018). 36. U.S. Marine Corps, “Assault Amphibious Vehicle (AAV),” http://www.candp.marines.mil/Programs/Focus-Area-4-Modernization-Technology/Part-3-Ground-Combat-Tactical-Vehicles/Assault-Amphibious-Vehicle/ (accessed August 3, 2018). 37. U.S. Department of the Navy, Department of Defense Fiscal Year (FY) 2019 Budget Estimates, Navy, Justification Book Volume 1 of 1: Procurement, Marine Corps, February 2018, p. 2, http://www.secnav.navy.mil/fmc/fmb/Documents/19pres/PMC_Book.pdf (accessed August 16, 2018). https://www.armed-services.senate.gov/imo/media/doc/Walsh-Shrader-Garner_06-06-17.pdf (accessed August 16, 2018). 40. Walters, statement on “Marine Corps Readiness” February 8, 2017, pp. 7–8. 41. Lieutenant General Robert S. Walsh, Deputy Commandant, Combat Development and Integration, and Brigadier General Joseph Shrader, Commander, Marine Corps Systems Command, statement on “Fiscal Year 2019 Ground Forces Modernization Programs” before the Subcommittee on Tactical Air and Land Forces, Committee on Armed Services, U.S. House of Representatives, April 18, 2018, p. 10, https://docs.house.gov/meetings/AS/AS25/20180418/108159/HHRG-115-AS25-Wstate-ShraderJ-20180418.pdf (accessed August 17 2018). 42. The average age of the M1A1 was 26 in 2016. Paxton, statement on “U.S. Marine Corps Readiness,” March 15, 2016, p. 15. No new M1A1 Abrams have been commissioned since that time, so the average age is estimated as 28 in 2018. 43. U.S. Marine Corps, Concepts and Programs, “Ground Equipment Age,” last revised April 3, 2014, http://proposed.marinecorpsconceptsandprograms.com/resources/ground-equipment-age (accessed August 17, 2018). 44. U.S. Department of the Navy, Department of the Navy Fiscal Year (FY) 2019 Budget Estimates, Justification of Estimates: Operations and Maintenance, Marine Corps Reserve OMMCR), February 2018, p. 28, http://www.secnav.navy.mil/fmc/fmb/Documents/19pres/OMMCR_Book.pdf (accessed August 17, 2018). 45. Walsh and Shrader, statement on “Fiscal Year 2019 Ground Forces Modernization Programs,” April 18, 2018, p. 9. 46. International Institute for Strategic Studies, The Military Balance 2018: The Annual Assessment of Global Military Capabilities and Defence Economics (London: Routledge, 2017) pp. 53. 47. U.S. Marine Corps, 2018 Marine Aviation Plan, p. 45.
https://www.marinecorpstimes.com/news/your-marine-corps/2018/05/16/the-corps-is-down-to-one-final-ea-6b-prowler-squadron/ (accessed August 17, 2018). 49. U.S. Marine Corps, 2018 Marine Aviation Plan, p. 44. 50. GlobalSecurity.org, “F/A-18 Hornet Service Life,” last modified May 2, 2018, https://www.globalsecurity.org/military/systems/aircraft/f-18-service-life.htm (accessed August 17, 2018). 51. Paxton, statement on “U.S. Marine Corps Readiness,” March 15, 2016, p. 9. 52. Vice Admiral Paul Grosklags, Representing the Assistant Secretary of the Navy (Research, Development and Acquisition); Lieutenant General Steven Rudder, Deputy Commandant for Aviation; and Rear Admiral Scott Conn, Director, Air Warfare, statement on “Department of the Navy’s Aviation Programs” before the Subcommittee on Tactical Air and Land Forces, Committee on Armed Services, U.S. House of Representatives, April 12, 2018, p. 3, https://docs.house.gov/meetings/AS/AS25/20180412/108078/HHRG-115-AS25-Wstate-RudderS-20180412.pdf (accessed August 17, 2018). 53. U.S. Marine Corps, 2018 Marine Aviation Plan, p. 56. 54. Vice Admiral Paul Grosklags, Representing Assistant Secretary of the Navy (Research, Development and Acquisition); Lieutenant General Jon Davis, Deputy Commandant for Aviation; and Rear Admiral Michael C. Manazir, Director Air Warfare, statement on “Department of the Navy’s Aviation Programs” before the Subcommittee on Seapower, Committee on Armed Services, U.S. Senate, April 20, 2016, p. 3, http://www.armed-services.senate.gov/imo/media/doc/Grosklags-Davis-Manazir_04-20-16.pdf (accessed August 13, 2017). 55. U.S. Marine Corps, 2018 Marine Aviation Plan, p. 35. 56. Megan Eckstein, “Marines Declare Initial Operational Capability on F-35B Joint Strike Fighter,” U.S. Naval Institute News, July 31, 2015, https://news.usni.org/2015/07/31/marines-declare-initial-operational-capability-on-f-35b-joint-strike-fighter (accessed August 17, 2018). 57. U.S. Marine Corps, 2018 Marine Aviation Plan, p. 23. 58. U.S. Department of Defense, Office of the Under Secretary of Defense (Comptroller)/Chief Financial Officer, United States Department of Defense Fiscal Year 2018 Budget Request: Program Acquisition Cost by Weapon System, May 2017, pp. 3-2 and 3-9, http://comptroller.defense.gov/Portals/45/Documents/defbudget/fy2018/fy2018_Weapons.pdf (accessed August 17, 2018). 59. Andrew Feickert, “Joint Light Tactical Vehicle (JLTV): Background and Issues for Congress,” Congressional Research Service Report for Members and Committees Congress, February 27, 2018, p. 1, https://fas.org/sgp/crs/weapons/RS22942.pdf (accessed August 17, 2018). 61. Testimony of John M. Garner, Program Executive Office, Land Systems Marine Corps, in stenographic transcript of Hearing to Receive Testimony on Marine Corps Ground Modernization in Review of the Defense Authorization Request for Fiscal Year 2018 and the Future Years Defense Program, Subcommittee on Seapower, Committee on Armed Services, U.S. Senate, June 6, 2017, p. 63, https://www.armed-services.senate.gov/imo/media/doc/17-56_06-06-17.pdf (accessed August 18, 2018). 62. U.S. Department of Defense, Office of the Under Secretary of Defense (Comptroller)/Chief Financial Officer, United States Department of Defense Fiscal Year 2018 Budget Request: Program Acquisition Cost by Weapon System, p. 3-1. 63. U.S. Department of Defense, Office of the Under Secretary of Defense (Comptroller)/Chief Financial Officer, United States Department of Defense Fiscal Year 2019 Budget Request: Program Acquisition Cost by Weapon System, February 2018, p. 3-2, https://comptroller.defense.gov/Portals/45/documents/defbudget/FY2019/FY2019_Weapons.pdf (accessed August 18, 2018). 64. Feickert, “Joint Light Tactical Vehicle (JLTV): Background and Issues for Congress,” p. 1. 65. U.S. Department of Defense, “Department of Defense Comprehensive Selected Acquisition Reports (SARs) for the December 31, 2017 Reporting Requirement as Updated by the President’s FY 2019 Budget,” March 16, 2018, p. 4, https://www.acq.osd.mil/ara/am/sar/SST-2017-12.pdf (accessed August 18, 2018). 66. Garner testimony in stenographic transcript of Hearing to Receive Testimony on Marine Corps Ground Modernization in Review of the Defense Authorization Request for Fiscal Year 2018 and the Future Years Defense Program, p. 63. 67. Congressional Quarterly, “Senate Armed Services Committee Holds Hearing on the Marine Corps,” CQ Congressional Transcripts, June 6, 2017, http://www.cq.com/doc/congressionaltranscripts-5117362?2 (accessed August 18, 2018). 68. U.S. Department of the Navy, Department of Defense Fiscal Year (FY) 2018 Budget Estimates, Navy, Justification Book Volume 1 of 1: Procurement, Marine Corps, May 2017, p. 211, http://www.secnav.navy.mil/fmc/fmb/Documents/18pres/PMC_Book.pdf (accessed August 17, 2018); U.S. Marine Corps, Concepts and Programs, “Joint Light Tactical Vehicle,” http://www.candp.marines.mil/Programs/Focus-Area-4-Modernization-Technology/Part-3-Ground-Combat-Tactical-Vehicles/Joint-Light-Tactical-Vehicle-Family-of-Vehicles/ (accessed August 18, 2018). 69. Feickert, “Joint Light Tactical Vehicle (JLTV),” p. 9. 70. Ibid., pp. 4 and 6. 72. U.S. Department of Defense, “Department of Defense Comprehensive Selected Acquisition Reports (SARs) for the December 31, 2017 Reporting Requirement as Updated by the President’s FY 2019 Budget,” p. 4.
https://www.fas.org/sgp/crs/weapons/R42723.pdf (accessed August 18, 2018); U.S. Department of Defense, Office of the Under Secretary of Defense (Comptroller)/Chief Financial Officer, United States Department of Defense Fiscal Year 2018 Budget Request: Program Acquisition Cost by Weapon System, p. 3-9. 74. U.S. Department of Defense, Office of the Under Secretary of Defense (Comptroller)/Chief Financial Officer, United States Department of Defense Fiscal Year 2018 Budget Request: Program Acquisition Cost by Weapon System, p. 3-9. 75. Feickert, “Marine Corps Amphibious Combat Vehicle (ACV) and Marine Personnel Carrier (MPC),” Summary. 76. Lieutenant General Kenneth J. Glueck Jr., Deputy Commandant, Combat Development and Integration, and Commanding General, Marine Corps Combat Development Command, and Thomas P. Dee, Deputy Assistant Secretary of the Navy, Expeditionary Programs and Logistics Management, statement on “Marine Corps Modernization” before the Subcommittee on Seapower, Committee on Armed Services, U.S. Senate, March 11, 2015, pp. 8–9, https://www.armed-services.senate.gov/imo/media/doc/Glueck-Dee_03-11-15.pdf (accessed August 18, 2017). 77. With regard to this overall requirement—armored lift for 10 battalions of infantry—the AAV Survivability Upgrade Program would provide for four battalions, and ACV 1.1 and ACV 1.2 would account for six battalions. Ibid., pp. 7–8. https://www.defensenews.com/land/2018/06/19/bae-wins-marine-corps-contract-to-build-new-amphibious-combat-vehicle/ (accessed August 3, 2018). 79. Feickert, “Marine Corps Amphibious Combat Vehicle (ACV): Background and Issues for Congress,” p. 7. 80. Dunford, statement on Marine Corps readiness, February 26, 2015, p. 28. 81. Walsh, Shrader, and Garner, statement on “Marine Corps Ground Programs,” June 6, 2017, p. 5. 82. Lieutenant General Brian Beaudreault, Deputy Commandant, Plans, Policies, and Operations, statement on “Marine Corps Readiness” before the Subcommittee on Readiness, Committee on Armed Services, U.S. House of Representatives, March 6, 2018, p. 5, https://docs.house.gov/meetings/AS/AS03/20180306/106942/HHRG-115-AS03-Wstate-BeaudreaultB-20180306.pdf (accessed August 18, 2018). 83. Grosklags, Davis, and Manazir, statement on “Department of the Navy’s Aviation Programs,” April 20, 2016, p. 7. 84. Vice Admiral Paul Grosklags, Representing Assistant Secretary of the Navy (Research, Development and Acquisition); Lieutenant General Jon Davis, Deputy Commandant for Aviation; and Rear Admiral DeWolfe H, Miller III, Director, Air Warfare, statement on “Department of the Navy’s Aviation Programs” before the Subcommittee on Seapower, Committee on Armed Services, U.S. Senate, June 13, 2017, pp. 13–14, https://www.armed-services.senate.gov/imo/media/doc/Grosklags-Davis-Miller_06-13-17.pdf (accessed August 13, 2017). 85. U.S. Department of Defense, Selected Acquisition Report (SAR): V-22 Osprey Joint Services Advanced Vertical Lift Aircraft (V22) as of FY 2017 President’s Budget, RCS: DD-A&T(Q&A)823-212, March 21, 2016, p. 61, http://www.dod.mil/pubs/foi/Reading_Room/Selected_Acquisition_Reports/16-F-0402_DOC_64_V-22_DEC_2015_SAR.pdf (accessed August 30, 2016). 86. U.S. Marine Corps, 2018 Marine Aviation Plan, p. 78. 87. U.S. Marine Corps, 2017 Marine Aviation Plan, p. 78. 88. U.S. Marine Corps, 2018 Marine Aviation Plan, pp. 76 and 84. 90. Grosklags, Davis, and Manazir, statement on “Department of the Navy’s Aviation Programs,” April 20, 2016, p. 21. 91. U.S. Government Accountability Office, Defense Acquisitions: Assessments of Selected Weapons Programs, GAO-16-329SP, March 2016, p. 93, http://www.gao.gov/assets/680/676281.pdf (accessed August 13, 2017). 92. U.S. Department of Defense, Office of the Under Secretary of Defense (Comptroller)/Chief Financial Officer, United States Department of Defense Fiscal Year 2019 Budget Request: Program Acquisition Cost by Weapon System, February 2018, p. 1-16. 93. U.S. Government Accountability Office, Defense Acquisitions: Assessments of Selected Weapons Programs, p. 93. 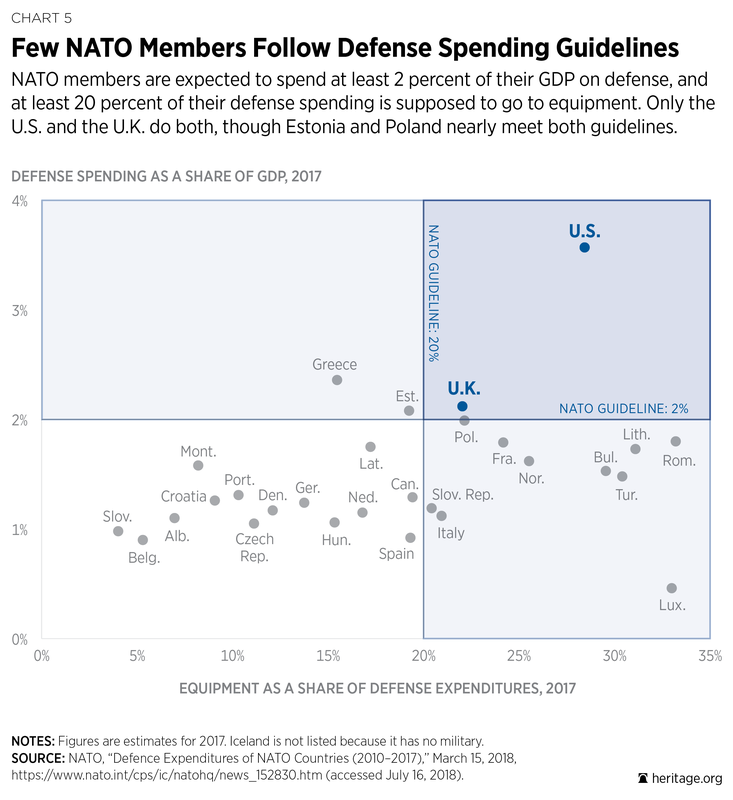 94. International Institute for Strategic Studies, The Military Balance 2017: The Annual Assessment of Global Military Capabilities and Defence Economics (London: Routledge, 2017) p. 53.
http://docs.house.gov/meetings/AS/AS03/20160706/105159/HHRG-114-AS03-Wstate-DavisJ-20160706.pdf (accessed August 13, 2017). 96. Rudder, statement on “Aviation Readiness,” November 9, 2017, p. 7. https://docs.house.gov/meetings/AS/AS03/20171109/106611/HHRG-115-AS03-Bio-RudderS-20171109.pdf (accessed August 3, 2018). 97. Beaudreault, statement on “Marine Corps Readiness,” March 6, 2018, p. 5. 98. Another six aircraft will be procured with research and development funding, bringing the program of record to 200 aircraft. U.S. Department of Defense, Office of the Under Secretary of Defense (Comptroller)/Chief Financial Officer, United States Department of Defense Fiscal Year 2019 Budget Request: Program Acquisition Cost by Weapon System, p. 1-16.
https://www.hqmc.marines.mil/Portals/142/Docs/CMC%20PB18%20Posture%20Written%20Testimony%20Final%20edited%20for%20web.pdf?ver=2017-07-28-161000-643 (accessed August 18, 2018). 100. Walters, statement on “Marine Corps Readiness,” February 8, 2017, p. 9. 101. U.S. Marine Corps, Commander’s Readiness Handbook, May 2014, p. iv, https://www.hqmc.marines.mil/Portals/138/HiRes%20Commanders%20Readiness%20Handbook.pdf (accessed August 18, 2018). 102. Beaudreault, statement on “Amphibious Warfare Readiness and Training (Interoperability, Shortfalls, and the Way Ahead),” December 1, 2017, p. 7. 103. Cary B. Russell, Director, Defense Capabilities and Management, U.S. Government Accountability Office, “Navy and Marine Corps Training: Further Planning Needed for Amphibious Operations Training,” GAO-18-212T, testimony before the Subcommittee on Readiness, Committee on Armed Services, U.S. House of Representatives, December 1, 2017, p. 5, https://docs.house.gov/meetings/AS/AS03/20171201/106681/HHRG-115-AS03-Wstate-RussellC-20171201.pdf (accessed August 13, 2018). 104. Beaudreault, statement on “Amphibious Warfare Readiness and Training—Interoperability, Shortfalls, and the Way Ahead,” December 1, 2017, p. 4. 105. U.S. Marine Corps, 2018 Marine Aviation Plan, p. 8. 106. Rudder, statement on “Aviation Readiness” November 9, 2017, p. 3. 116. U.S. Department of the Navy, Highlights of the Department of the Navy FY 2018 Budget, 2017, p. 1-4, http://www.secnav.navy.mil/fmc/fmb/Documents/18pres/Highlights_book.pdf (accessed August 18, 2018). 117. Neller, statement on “Posture of the Department of the Navy,” June 15, 2017, p. 9. 118. Paxton, statement on “U.S. Marine Corps Readiness,” March 15, 2016, p. 7. 119. General Robert B. Neller, Commandant of the Marine Corps, statement on “The Posture of the United States Marine Corps” before the Committee on Armed Services, U.S. Senate, April 19, 2018, p. 13, https://www.armed-services.senate.gov/imo/media/doc/Neller_04-19-18.pdf (accessed August 13, 2018). Emphasis in original. 120. Dana, statement on “Marine Corps Readiness,” March 6, 2018, p. 3. 121. This count is based on an average number of 1.5 divisions deployed to major wars (see Table 3, pp. 311–312) and an average of 10–11 battalions per division.